American Football, Athletics, Australian Rules, Basketball, Baseball, Boxing, Cycling, Cricket, Darts, Football, GAA Football, GAA Hurling, Golf, Greyhounds, Handball, Horse Racing, Ice Hockey, Motorsport, Entertainment/TV, Politics, Rio Olympics, Rugby League, Rugby Union, Snooker, Speedway, Tennis, UFC/MMA, Volleyball, Politics, entertainment, celebrities, awards. DEPOSIT €5 GET €25 IN BONUSES. Large selection of sport offers and payment options. Boylesports is one of the largest bookmakers in Ireland founded in 1989. The organization was founded by John Boyle in 1982 and had more than 77 shops in Ireland by 2004. The business has since evolved and now it employs more than 1200 people. Headquarters of the company are located in Dundalk, County Louth, but the company works under the jurisdiction of Gibraltar laws. The business has over 205 retail stores in the country and offers a telephone betting service called “Phone-a-bet.” Of course in our modern society internet users are more interested in their online betting platform and their dedicated betting app. As a growing brand, the company has sponsored some events in Horse Racing and Football. The site has been online since 2001. In 2007, Boylesports signed a four-year deal to sponsor Sunderland A.F.C. Around the same time in 2008 the bookmaker became a sponsor for another Premier League club Aston Villa F.C. The site has quickly become one of the most visited ones in Europe. As a top 50 of the most famous bookmakers in the world, Boylesports management has made sure their clients are always satisfied and have many betting opportunities awaiting them at them at the site. Boylesports has a very intuitive and simple design where you can find every market you need easily. The fact that the company is situated in Ireland means that horse racing is a very popular sport on the platform. There is a ton of wagers available for it and users who love the sport can advantage from every one of them. They can find all sorts of stats about jockeys, ratings, trainer form and many more. Despite the fact that the company is most famous with its Horse Racing bets and sponsorships you can find a wide variety of other sports markets inside. Football, Golf, Tennis, Greyhounds, Boxing, Baseball, Snooker and many other major sporting events are covered. You can even find wagers on less famous sports such as Darts, Gaelic Football, Pool, and Speedway. Wagers on entertainment and politics events are also available. Being a top of the industry bookmaker Boylesports also offers Casino, Live Casino, Bingo, Lotteries and other games. The site also offers a wide selection of Virtual sports where you can find Flat Racing, National Hunt, Greyhounds, Motor Racing, Cycling, and Football. Live betting is also supported for most major events. Financial and Daily special offers are also available. Boylesports has created an app for mobile users on the go that works with most types of modern mobile devices. It also has the casino where you can enjoy Black Jack, Poker, Roulette and various types of Slots. As horse racing is one of the main events on the site. You can find a very attractive Prizewise tips offer for odds, where even if the sites odds are lower they will honor the advised prices from the tipster. Football markets are also very well covered. Despite the fact that you don’t have the option to bet on an Asian handicap you can find other famous betting options. Double chance, over and under, draw no bet, both teams to score, winning margin, total goals and many more. Score cast, time of goal and other special markets are available for the players who seek the most exact wager possible. There are more than 50 markets for a major sporting event. Odd formats are Decimal (Europe), UK and US. The minimum bet for an event is one of the lowest in the industry of €0,1. Superb online experience is what the company is aiming for and they made sure their customers are always satisfied. Boylesports employees have done their best to create a safe environment for betting. The site uses an SSL encryption that ensures the players their data and funds are protected. For now only four major languages are supported English, German, Spanish, and Swedish. 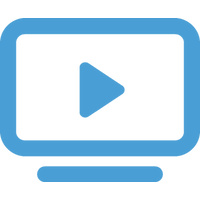 The customer support team is available 24/7 for any questions concerning the online betting experience of the users. Live chat is supported, and a free phone option for Ireland and the UK is available. You can also write a ticket with any problem you have experienced with the platform. Responsible betting is also something the company has taken care of, and they make a lot of effort to promote healthy use of their products. Boylesports has made sure there are a lot of deposit methods for you to use. Available methods are many. There are no deposit fees for any of the methods you choose to use which is quite nice. The minimum amount of deposit is €10 for all deposit methods. Transaction time is usually instant, except when you have to wait for up to 5 days. Withdrawal options are usually the same as your deposit method. You’ll have to wait between 2 to 5 days for the funds to be transferred (5 to 9 for a Bank Wire). Bonus offers from Boylesports are available even before you enter the site which means the company makes sure you stay updated with their promotions all the time. The bonus offers are frequently updated, and users will find new offerings every couple of months. 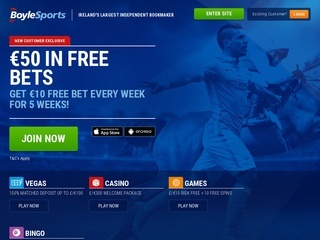 If you create a new account, you are entitled to up to €25 in free bets. Creating an account on the platform makes you eligible for a €25 (bet €10 and get €25 bonus). If you place another five bets, you can get a free bet for your average stake at the amount of €25 tops. You can find all current bonuses on the “Promotions” section of the site.